I’ve gone deep into my studies, that’s why you haven’t been seeing me. Been testing new techniques that come to mind. Even though you think of science as all logic, there’s a component of creativity to it. Lately, my mind has been keeping me up an extra two hours a day so that means instead of sleeping for my usual 15 hours a day, I sleep 13. I’m pooped. My projects have been all cooped up in my brain until now. Had to catch up on my beauty sleep before I got to writing again. I’m a cat and have very particular needs. For this project I starved two humans and a cat who happens to be my adopted brother, Jiminy, from hugs, kisses, and cuddles. It did not go well for all three of them. Subject B, the girl, carried me to bed and I run away to sleep on one of my various condos after 5 minutes in bed. She brings me back and I run away again. Then she tries to bring me back and I bite her. This routine carried on for 3 months until I decided to try something new. The next experiment lasted a couple weeks. I would keep running from her so I was ever elusive, bare minimal physical contact. This led to her carrying her teddy bear saying the bear gives her more affection. After a few days of her and the teddy bear I decided not to carry on because if she doesn’t get enough cat time, she could fall into a catpression (depression) where she wouldn’t want to get out of bed. This would mean no meals. Subject C, the boy, “It’s all your fault. You started cuddling him in different ways and now he no longer hugs me.” He always lectures the girl about spoiling me. Thing is, she isn’t, I have mind control and get her to do whatever I want. All I have to do is look a certain way, what she calls goo-goo eyes and she melts from there. MIND CONTROL. Jiminy, my brother, has been getting bare minimal licks. Like 1-3 times a week instead of everyday and I chase him only 3 out of 7 days instead of all week. He now goes to the girl human and sometimes the boy human for attention. Jiminy is so starved for love, he has to confront his extreme social anxiety. He’s been cuddling them more than usual and even allowed Subject B to kiss his cheek 4 times a month. There was time he would have cut her if she tried. Sometimes I like to beat him up just to get some more time so I can contemplate on my observations; 98% of the time this leads to him cuddling her for a good half hour. There are some rare moments when Jiminy is so lonely for my affection that he has to push back his fear of boy human. That’s when you can see Jiminy head butting Subject C’s hand. No matter what I do to the cat, he stays loyal to me; the humans come in a good 2nd and 3rd to me. They keep interrupting me because they need attention! 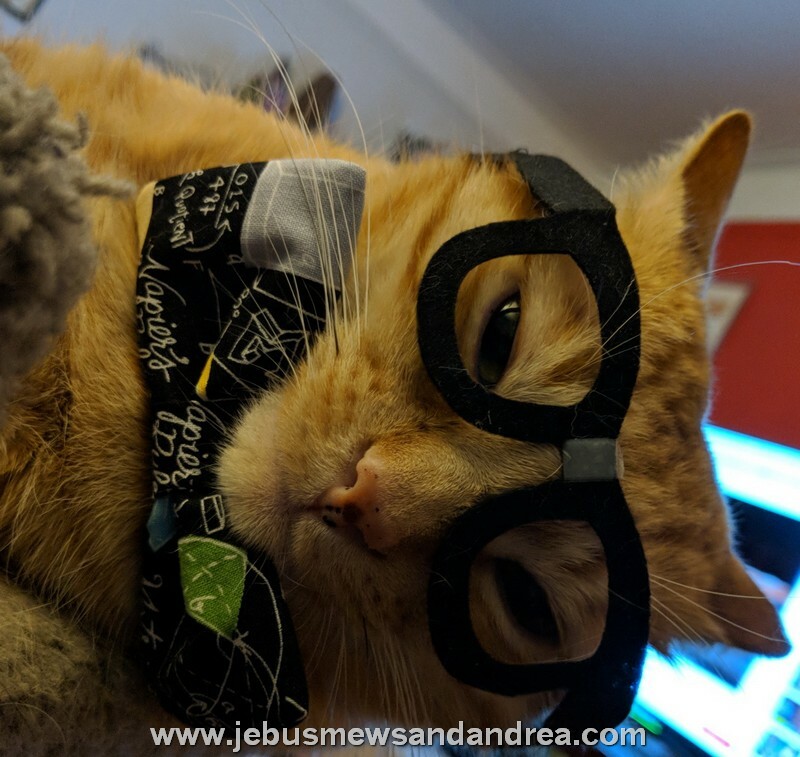 Posted on June 9, 2018 by jebusandandrea	This entry was posted in Cats, Jebus Mews, Studies of Dr. Chewie and tagged Cats, Cats in Costume, Caturday, Companion Animals, Felines, Pets. Bookmark the permalink. Good to see you back here, Dr. Chewie! You have been missed. 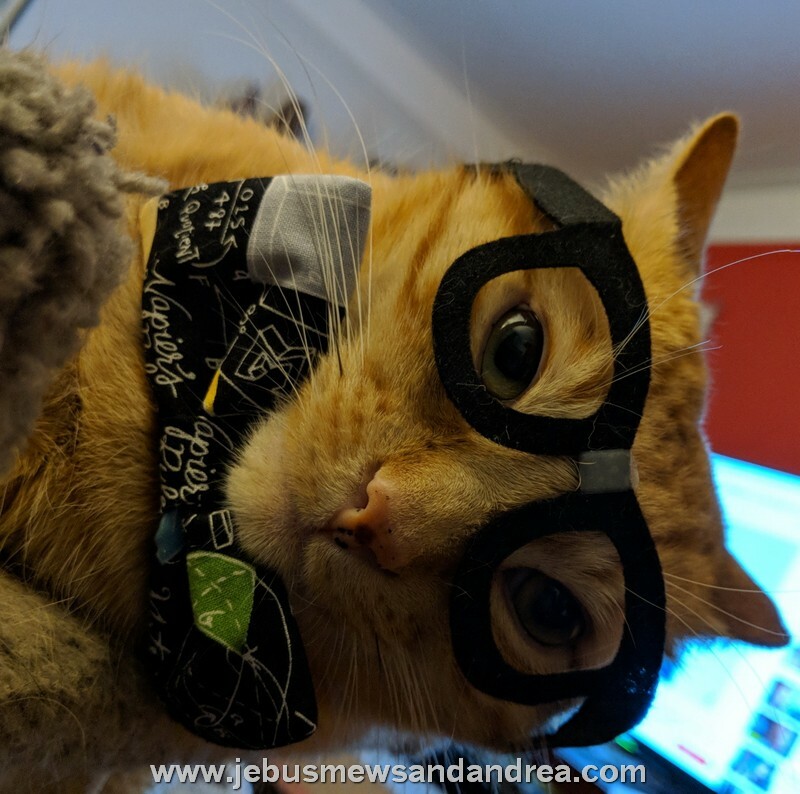 You have very interesting cat observations and we humans can learn a lot from you. I’ve been a bit behind. The humans and the cat cause constant interruptions.